I still hope the JPE one gets up at this stage. A REVAMPED courts precinct, worth an estimated $500 million, will form the centrepiece of a "massive reform" of the state's justice system, the Premier says. 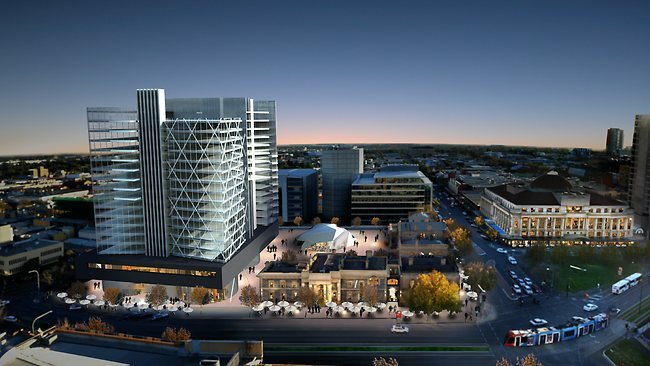 Premier Jay Weatherill, Attorney-General John Rau and Infrastructure Minister Tom Koutsantonis this afternoon announced expressions of interest were being sought, from private developers, to “transform” the courts precinct. 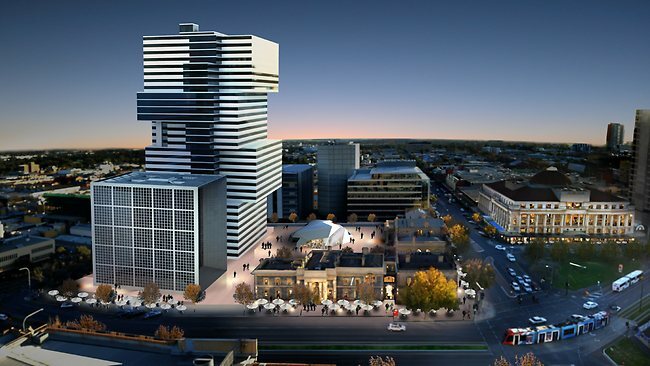 The concept would see the heritage-listed Supreme Court buildings on the corner of King William St and Victoria Square kept, but the much-maligned courts library building behind them torn down. Mr Weatherill said it would be replaced with a “first-class 21st Century justice facility” that would be “hardwired” with information technology resources to establish a paperless justice system. That facility would unify the Supreme, District, Youth and Coroners Courts in a single location - benefiting not only lawyers and the judiciary, but the entire community. “Obviously this is a very dilapidated precinct (currently), and those who use the courts have had to put up with substandard facilities for too long,” he said. “The justice system needs massive reform ... someone who has suffered a wrong should not have to wait around for that to be dealt with and justice to be done. The state’s archaic court facilities have been a source of dispute between judges, lawyers and multiple state governments for more than a decade. BIGGER courtrooms with disabled access. IMPROVED infrastructure, including modern audiovisual equipment. REFURBISHED elevators connecting courtrooms with underground cells. In 2011, then-Chief Justice John Doyle could not access his own office, following a fall, because the building was not wheelchair-accessible. Earlier this year, Chief Justice Chris Kourakis revealed the courts’ IT system was 25 years old and prone to failing as often as once a week. Today, Mr Rau said the new facilities would address those problems. “We will have a more efficient justice system because we will hardwire technologies into the building itself,” he said. “Everything that is now done with paper will be done electronically, from the initial issuing of a summons through to the hearing of cases. Mr Weatherill said a new court building meant fewer delays due to lack of court space and therefore less grief and angst for victims awaiting justice. He stressed that the project would be undertaken by private developers on Crown land. He said the State Government would then lease the facility back from the developers, as it currently does with the Sir Samuel Way Building. “The cost of that lease has been budgeted for in the State Budget,” he said. Mr Koutsantonis said the goal was to unify the higher courts in one place. 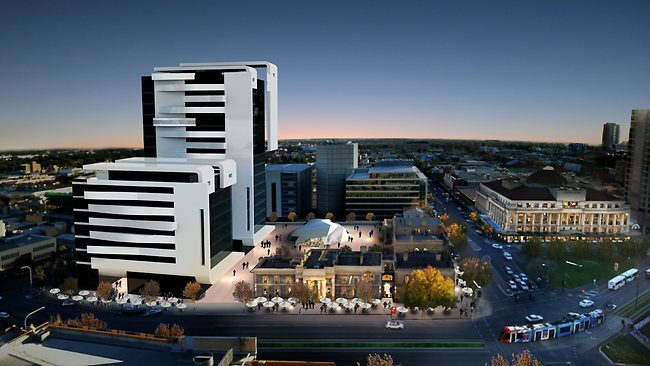 “With the Adelaide Magistrates Court on the opposite corner of Victoria Square, South Australia would be unique in being able to provide a fully integrated precinct,” he said. He said that, as a commercial project, space in the new courts could be leased to other government departments including the Office of the Director of Public Prosecutions. The developers could also lease space to private law firms, cafes and other legal industry businesses. “Preliminary investigations indicate a privately funded project of this scale has the potential to deliver some 1500 construction jobs,” he said. I like the 1st and 3rd designs. the 2nd looks like UNO's brother. 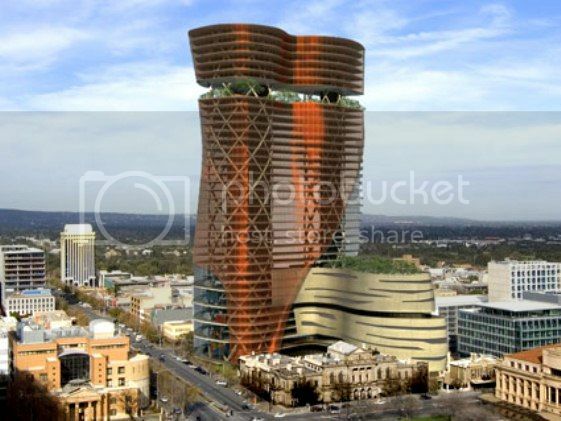 I love the first design, but it would be better without that copper coloured facade. A clear facade would be much more desirable. 1st and 4th designs for mine. Between the remaining three, 4th for me. Yeah, the first one was an unsolicited proposal by JPE. The next 3 are government sourced concepts specifically for the proposal being called for. It's unlikely that any of them will resemble the final design as it'll be a private design and construct project, but they're the best ones to go on for now. The 4th design is my preference, it's not too diferent from the surrounding high rise, but bigger, brighter,and more imposing - looks like at least 30 floors. I like the footpath usage they show. Hope the lower floor gives access to coffee shops/ eateries and other street interactive functions. Pushes again for upgrading KWS Sth tramline facilities. HOPE this eventuates - it seems the long planned KWS 'spine' is going to develop afterall. The JPE proposal was the best. Now all they have to do is cut it back to fit the price tag. Also minus all those trees etc., which are useless (do a Google search on the matter). Ho Really wrote: The JPE proposal was the best. Now all they have to do is cut it back to fit the price tag. Also minus all those trees etc., which are useless (do a Google search on the matter). Why would you state 'those trees' are 'useless'? Greenery is a component that can make or break a concept design. And another thing, if they have to cut back a design to make it fit into their projected budget; then they shouldn't be going with that design, they should find something that looks great and also meets their budget without the need to cut features. rhino wrote: 1st and 4th designs for mine. I couldn't agree more. the openess of VicSquare means an iconic building will have many nice viewing angles no matter what else is built around the area. Hope the architects dont give us a damp squib of a building. Patrick_27 wrote: Why would you state 'those trees' are 'useless'? Greenery is a component that can make or break a concept design. He's referring to the trees on the roof and the sky deck. There's been a few articles around that discuss the trend of sticking trees high up buildings in architectural renderings, and the reality of doing so. Please Please, not more square boxes! Even the "unorthodox" design has offset boxes stacked upon each other at varying angles. And as usual, a façade right on the footpath. I get the need for large square floorplates in a small market like Adelaide to appeal to a wider range of tenants. But here is an opportunity, in a purpose built building, on a prominent site, being used by government/legal professions to have some angles, curves and setback with a smaller footprint and more height. It would make more of a feature of the heritage buildings on the corner, as they would not be overpowered at street level.